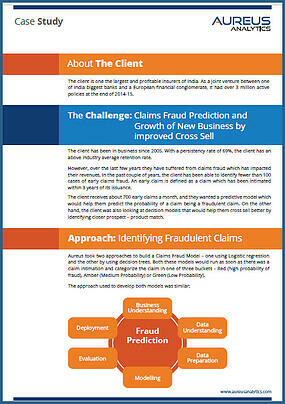 Aureus Analytics built two Claims Fraud Models that run as soon as a claim is initiated. This client had been suffering from claims fraud which has impacted their revenues. Additionally, they wanted to make cross-selling more accurate and effective. They needed help predicting the probability of a fraudulent claim and come up with an effective cross-sell model. Fill out the form to see how Aureus Analytics helped this major insurer with fraudulent claim identification and a cross-sell model.